This entry was posted in Bulbs, Butterfly Bed, Garden, Herb Bed, Plants and tagged Garden, Plants, Spring. Bookmark the permalink. Beautiful blooms already! I expect there will be even more beauty as the beds fill in. Looking great! I love watching things grow into beautiful gardens. I think it is better to draw a plan and label or get those engravable metal tags. I draw a plan too. It is difficult to keep up after a few years though, as you inevitably split and move plants around. Yes Ali, I found that in my old garden too. And some plants also disappeared! I am trying hard not to be jealous. I already miss new spring plantings, but I at least brought home a few annuals for our porch. Wishing you success in your new bed. Looking forward to watching these beds bloom and mature, Cathy. Maybe you’ll revive the Tuesday View this year? Are you retaining the old property as well? I have grown fond of seeing that garden! I used to keep garden plans and labelled plants, but that fell be the wayside as things died, were moved and/or were replaced. I do have those metal tags that Amelia refers to above, but haven’t got around to using them! I don’t get many visitors and those that do seldom care to know what the name is, so I’m lazy about marking things! Hi Eliza. Yes, I am sure to post a photo or two of the old garden… after spending a few hours there tidying up! So glad it is easy to care for there. Yes, we intend to keep it for now – a new housing development is planned right next to it though. (The main reason we moved!) Same here about visitors not being terribly interested in names of plants. I do like to keep a tab on what I have though, so will probably just stick to lists for now. Such lovely flowers! I’m doing a lot of prep work this year to prepare for gardening next year. I’m starting with food, but I hope down the road to add flowers and make it into something beautiful. Wonderful. I am doing it the other way round…. flowers first and next year we hope to start a vegetable garden. ButbI do have plenty of herbs. 🙂 Thanks for visiting! Your garden is beautiful! It’s lovely that you’re getting butterflies and bees. My beds are still full of weeds, but the daffodils, hellebores, snow glories, and hyacinths are blooming. It’s wonderful. Good to hear you have got some spring flowers too. We need them after all those weeks and months of winter! Those Hellebores and Tulips are stunning, along with everything else. My Hellebores are just about ready to bloom. This time of year is such a joy! Thanks Debra. 🙂 I will have to try and get some shots of the butterflies in April. 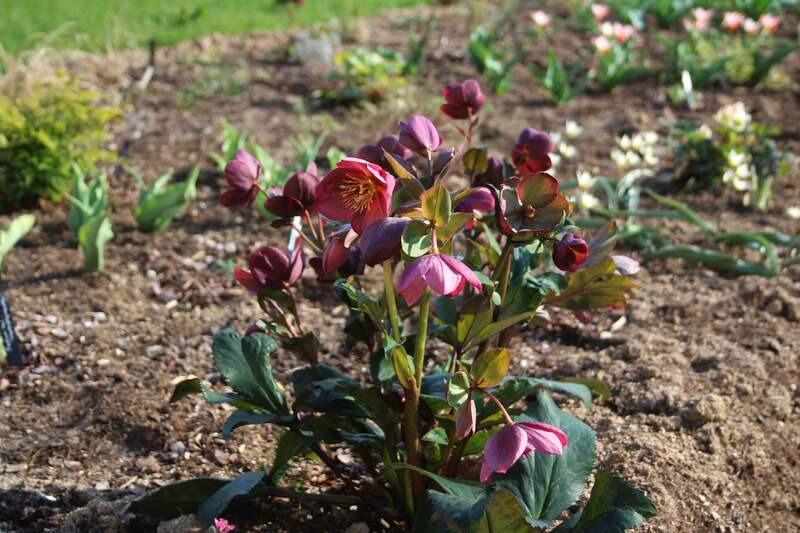 What beautiful hellebores you have Cathy! Mine are just starting to bloom, so I envy that you have enjoyed yours since October. It will be fun to watch your gardens mature. I had one butterfly yesterday too. I have never seen a butterfly this early in the year for our cold climate. It was a delight to the eyes as I’m sure yours were too. Thanks Cindy. 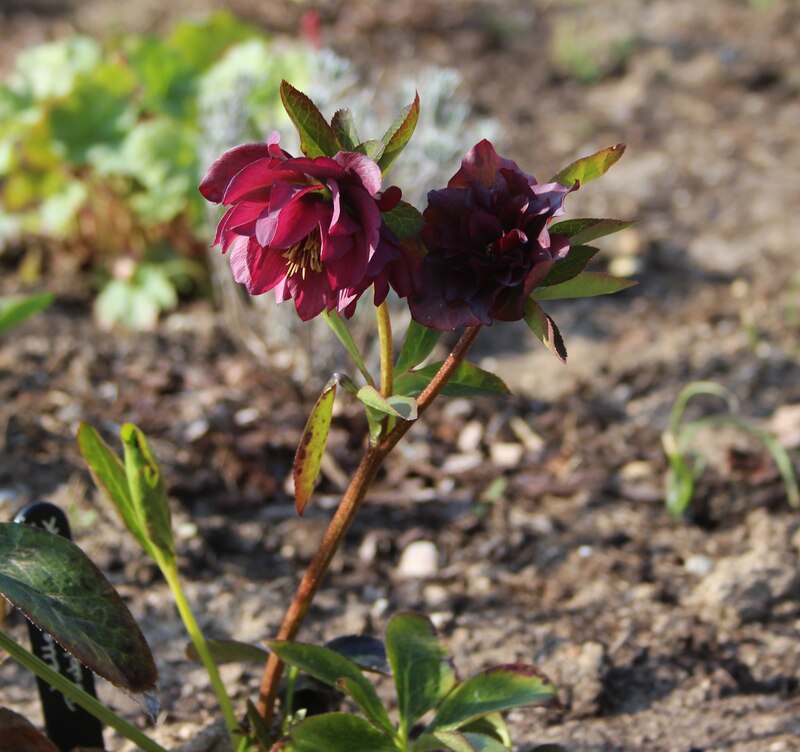 I was amazed that the hellebores continued flowering all winter – the nursery must have given them a great mix of feed before they came home with me! 😉 Hope you get lots more butterflies soon. What fun having a blank canvas to work on and watching it develop and mature over the months and years. You have made a good start. I have never resolved the label problem, so now if I am not sure what something is I take a photo of the plant and label together. Oyster shells sounds like a lovely idea. I immediately thought of the song Mary Mary quite contrary! Starting a garden from scratch has to be really fun, especially when you are an experienced gardener. Your grass is really green. I only noticed how green the grass has got when I looked at the photos later! Yes, the leaves are starting to sprout on the trees all around us too! Cathy I love your flowers. It is special the Hellebores that are jewels and the Tulips that are wonderful. I like Chionodoxa a lot. If you have endured this winter under all the snow, you have already secured the Chionodoxa for years and proliferate at ease: I tell you because I planted the first about 10 years ago and now there are a lot and are beautiful. Happy week of gardening and good weather. Here in Madrid it’s raining and it’s 9ºC. 🙂 🙂 Greetings from Margarita. Cathy, I’m afraid not. It is colder and rains in Madrid and it snows 800 meters in the north or less. And keep it up until at least Tuesday. After that they have not given more information in the news about the weather. To stay warm touches me. Have a good weekend 🙂 . Greetings and memories of Margarita. How exciting Cathy to watch your new beds develop. ‘Heart’s Delight’ is a little beauty. I’m going to write down its name as although I don’t have much luck in general with tulips I might fare better with the dwarf varieties. 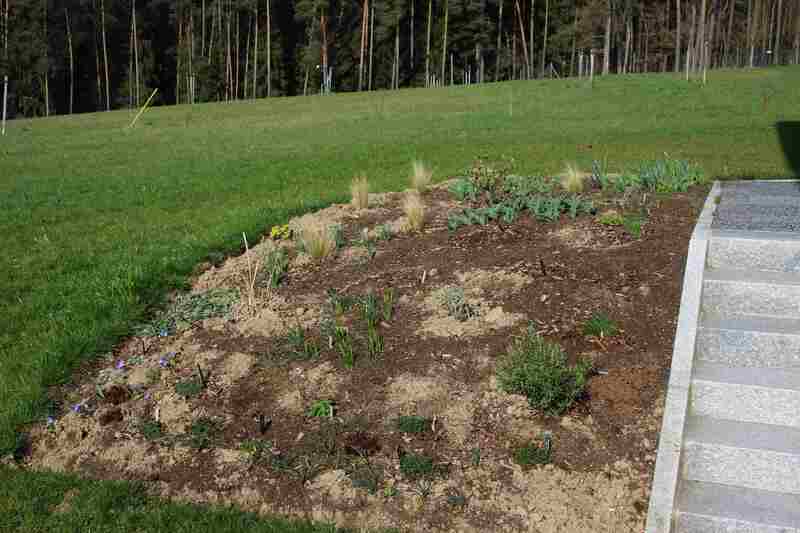 Is the soil in your new garden very different to the other? Heart’s Delight is a real treasure Anna, so I hope you find some. 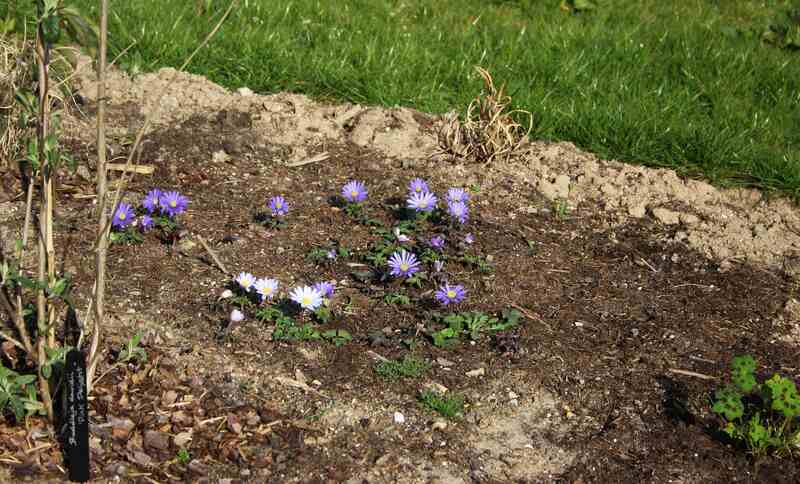 The soil here is not as alkaline as in the rockery, and it is slightly sandy too so does not retain water well – not good as we have not had rain for a few weeks again and it looks like we may be in for another dry spring. It’s so exciting making a new garden, isn’t it? Brimstone butterflies are my favourite. We tend to only see them in spring. Is that the same for you? Cathy, how exciting to be planting a whole new garden. I love that you’ve brought some favorites from your old place and that you’ll mix in new ones. Gardens, in my experience, really take off at the 18 month mark and by three years, have filled in beautifully. Here are a few tips for plant identification. I created a list of everything in my garden and created a page on my blog. I broke things down into annuals, perennials, herbs, native, trees and ground cover. Slowly I’m trying to link a photo to the name, either from my garden blog or from an internet listing. Another thing I’ve seen and have always wanted to do is sketch the various garden beds. The ideas is to drop the various shapes onto graph paper, then using colored pencils and symbols, identify what you’ve planted. I’ll leave this comment, but will be back with a few links. Thanks for your tips and input Alys. Yes, lists are always a great idea, but making a page and adding photos is even better! I could never sketch a plant – no skill at all when it comes to drawing! But photos, yes. Thank you! Yes, I think I have seen this page of yours before and it is an excellent idea. Thanks Alys! 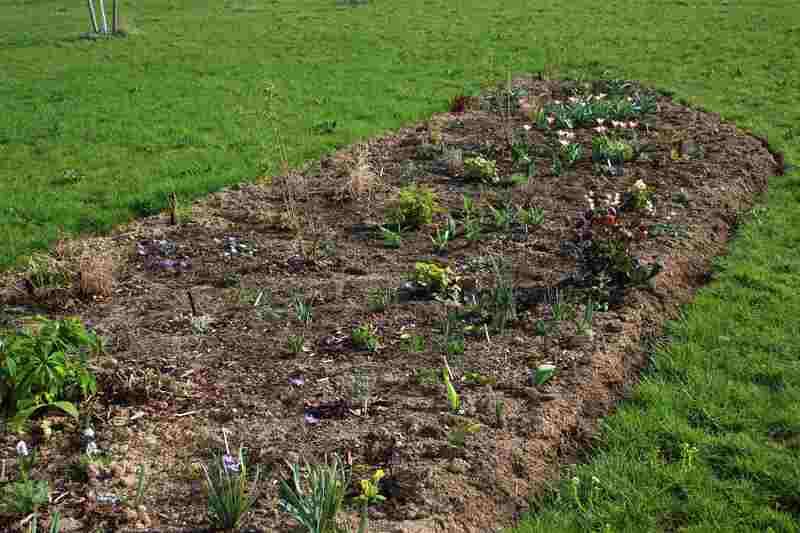 Your new beds look like they will be chock full of plants when they mature. A great start! It’s an exciting project Lisa! That is thrilling, Cathy – and most inspiring as my border is still brand new and mostly under weeds. I have my lemon thyme ready to go in, though. 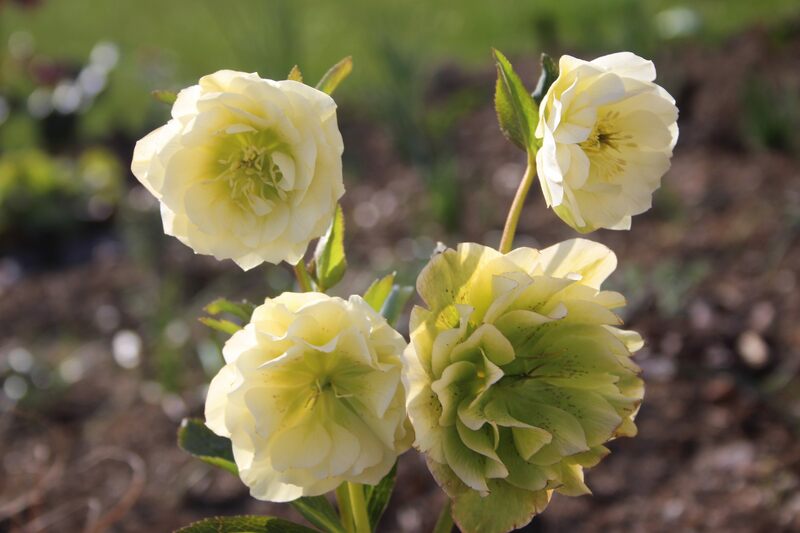 😉 Your hellebores are beautiful; I especially like that first ‘Ice N Roses’ single. 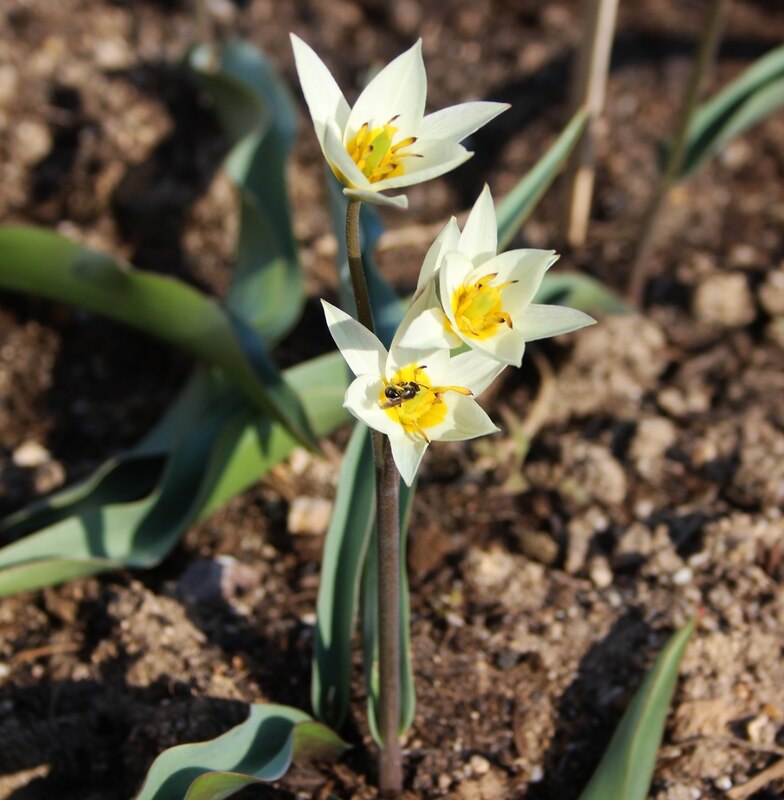 And the species tulips… This will be such a lovely garden to watch grow!! 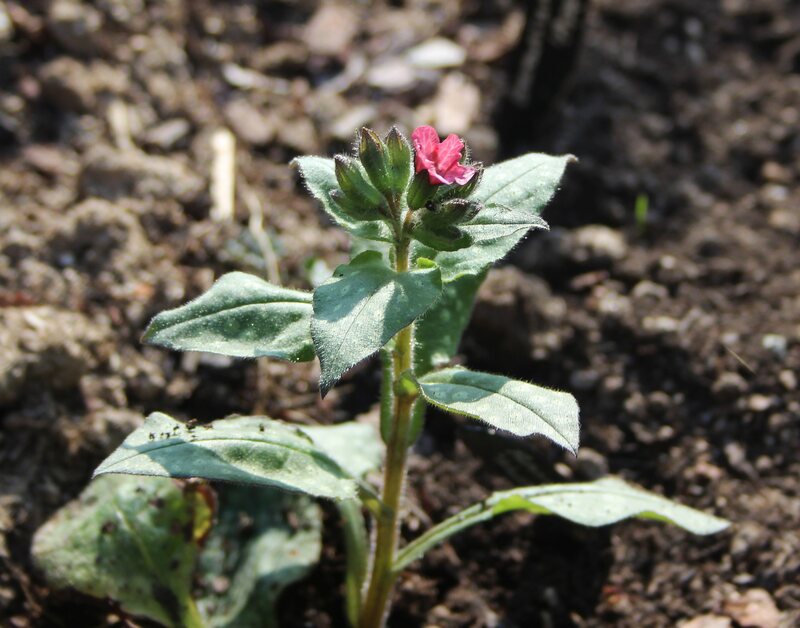 It’s always exciting in spring to see what will come up, but in a new garden even more so! Can’t wait to see what your garden will look like! Starting with a blank sheet is intimidating but also wonderful, as a designer that is what excites me most. That’s the most important thing – to have a clear idea of what you want to achieve. I can remember my gardens in Maine in the springtime, they too looked a little bare. By the end of summer, they were all filled out with not much room to add anything else if I wanted to. I’m happy that your rosemary survived, each year in New England it had to be replanted. The labels that we use on the camellia and rhododendron stock plants that will be out in the arboretum for many years are those aluminum strap like devices that are wired on loosely with copper wire. I print on the thin aluminum against the cardboard backing to imprint the cultivar name into the aluminum. I do so with a no good ball point pen. They do not last forever either, and they are quite expensive, but they work for a few years. Fortunately, the guy who need to remember the names really does remember the names. The labels are there for others. If they don’t find a label, they ask. As an arborist, I tag trees with those stamped out metallic discs that get nailed to trees. They can also be wired loosely to trees, or nailed to stakes. Of course, they are not practical for perennials that are regularly changing, but they might work for things that stay around for a while. Yes, the metal tags are useful for trees or shrubs, but not so much for perennials. I will probably take advice given above and take a photo of each plant in its place and label the photo! I love a new planting area – it’s always so full of possibilities – and it’ll be fascinating to see how these mature. Looking lovely already. The beds I planted a couple of years ago have already filled out and are a little too full in places! I was going to suggest photos for plants/labels but Chloris has already said that. As long as you’re organised with your photos (I’m not! ), it should work well. 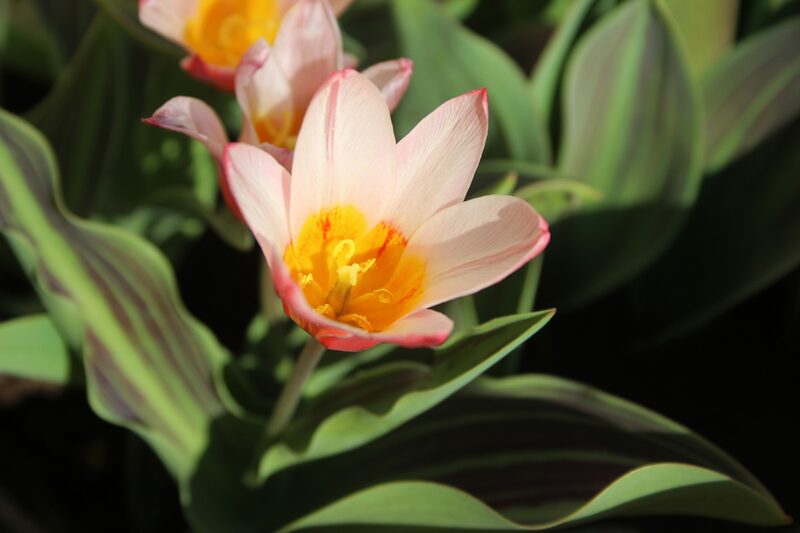 Hurrah for species tulips! 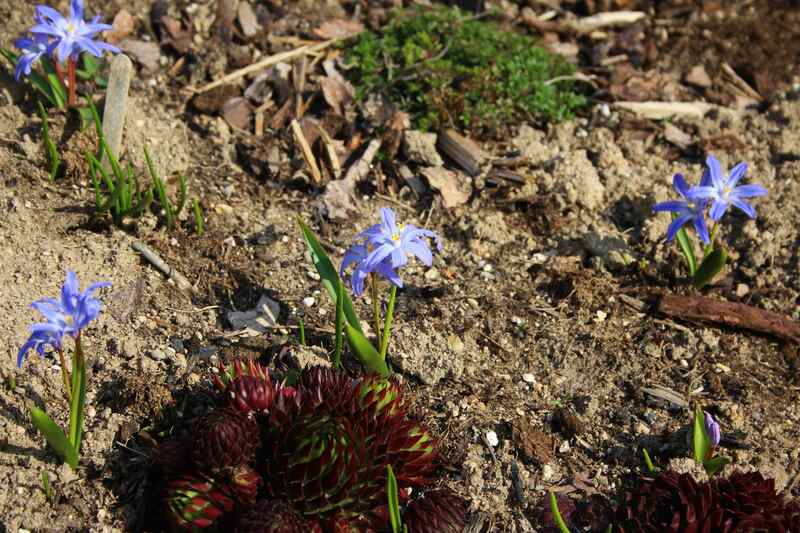 I’m waiting for my own Chionodoxa to start blooming. And hurrah for spring! 🙂 I am away from my garden for a week but I think all my Narcissi will be open by the time I get back.